I thought I deserved a pale ale style with a ton of exciting hops – and why not have those exciting hops delivered by way of an entire 100g pack of Summit pellets…for use as late additions only.? Mmmm, it’s going to be hop-tastic. 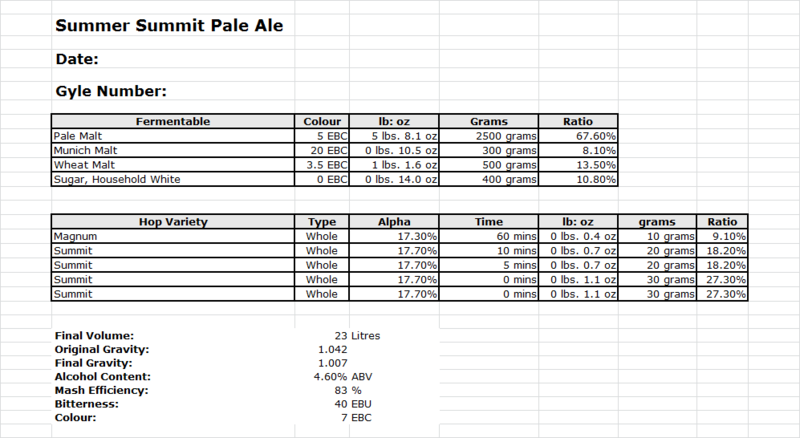 Here’s the recipe, which you might notice looks a bit light in the way of pale malt, and that’s because I’m a bloody idiot and didn’t weigh it out properly – ending up with 2.5Kg of Maris Otter in the grist, when I should actually have had 3.5Kg. But I did have a spare pack of Thai palm sugar, and 400g of that brought the gravity back into line…and as a bonus, it should dry the body out a little to make the finished beer even more hop-forward. The mash was a typical Braumeister sort of affair: 38C dough-in, 66C maltose rest and a 76C mash-out: for 0 Mins, 80 Mins and 10 Mins respectively. The mash at 0 Mins (Dough-in): circa 6.1 PH with an iodine test that turned blue – indicating unconverted starch in the mash…unsurprisingly. The mash at 45 Mins: 5.4/5.5 ph and a clear light-brownish iodine test – showing starch conversion was complete, but the refractometer only showed a gravity of 1038, which is the point where I did the maths and realised that I’d cocked up my weighing out of the grain…and that’s when I started weighing out the palm sugar. But all the starch converted within 45 minutes? Really? There was still a solid 35 minutes left of the 66C mash rest. I double-checked and it really had all converted. In theory I could have bailed out of the 66C mash rest there and then – and gone straight to mash out at 76C, but the wort was still cloudy, so I just left it to re-circulate and do it’s thing. Maybe next time, if the wort is clear and all the starch is converted, I’ll bail out early and save myself over half-an-hour and a good old chunk of electricity. 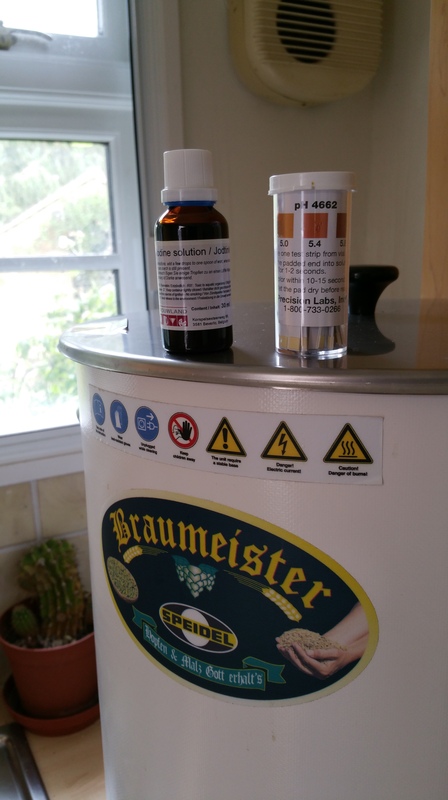 The PH testing also goes to show that I can make pale beers without any additional water treatment: if a piddly bit of Munich malt and some wheat malt are sufficient to drop the mash PH to anywhere between 5.8 and 5.4, I’m a happy man. Just before pitching the US-05 yeast, I aerated the wort for a minute at what looked like a slow simmer. …a bucket of water that leaked last night all over the spare bedroom carpet , which was enormously welcome when we were all trying to get out of the door this morning…this beer had better be good. PS: It’ll be getting a dose of 30g of Summit pellets for dry-hop on Monday (at 6 days), and I might even keg-hop it with some whole-leaf summit in a hop sock as I need that sort of hoppiness in my life.! 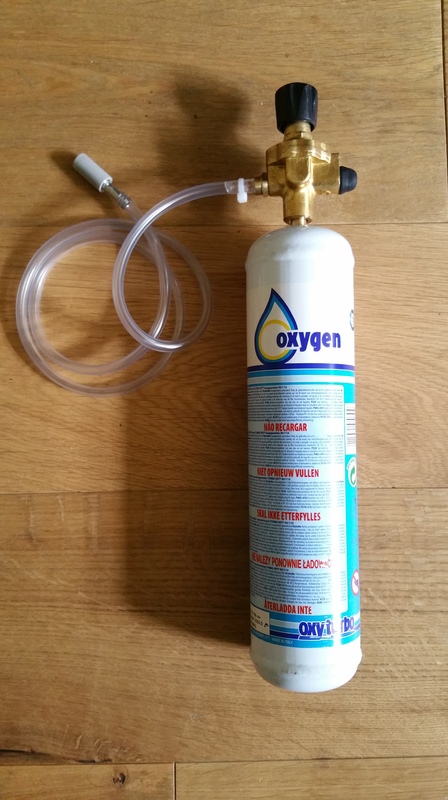 This time we’re looking at getting a good level of dissolved oxygen in your wort. A good level of dissolved oxygen in your wort before you pitch the yeast should increase the vigour of the ferment, lessen the chances of a stuck fermentation, increase the speed of the ferment and also has the added bonus of giving you increased girth and virility in the bedroom. So…shaking is not great, but better than nothing and aquarium pumps are OK but don’t really get you where you need to be. Another site recommends moving the airstone around in the wort to make sure you’re getting the maximum coverage. One important thing to definitely not do is touch the airstone – apparently the oil on your hands can block the pores up. I intend to go with White Lab’s advice and let my gentle simmer run for about a minute. Then I’ll wash it, boil it for a few minutes and before it’s next use, dunk it in star san.